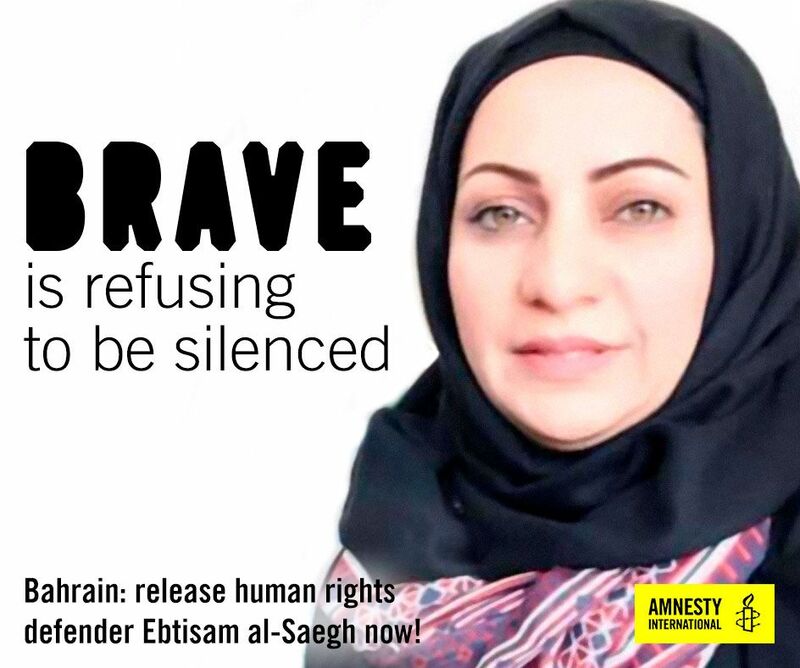 Prominent Bahraini human rights activist Ebtisam Al-Saegh has been charged under Bahrain's terrorism law. She remains in police custody three weeks after she was arrested for her work with the Geneva-based human rights group, Karama Foundation. Al-Saegh serves as the networking officer at Salam for Democracy and Human Rights, where she documents and drafts reports about rights violations. She is also a member of the umbrella human rights organisation, Bahrain Human Rights Observatory (BHRO). Last March, she participated at the 34th session of the UN Human Rights Council in Geneva. Security officers arrested her for the second time in less than two months, and raided her home, on July 3. Just before midnight, five cars and a minivan arrived at her home and a group of armed security agents, reportedly belonging to Bahrain's National Security Agency (NSA) raided her home without a warrant. They took her away from her husband and children. According to reports received by a group of United Nations human rights experts, Al-Saegh is being subjected to ill-treatment, long-term interrogation and held in solitary confinement at the Isa Town Women Detention Centre. The arrest comes just weeks after Al-Saegh suffered torture and abuse at the hands of the NSA. On 27 May, she was summoned to Muharraq police station for questioning about her human rights activities. She was immediately arrested and reported to the Gulf Center for Human Rights that she was tortured and sexually abused by members of the NSA. The security officers also threatened to murder her and her children. She was released seven hours later, and she had to go directly to hospital due to the trauma suffered. Al-Saegh has been harassed, detained and prevented from traveling by the Bahraini authorities because of her peaceful and legitimate human rights activities in the past. When she returned to Bahrain after speaking about human rights violations in her country at the 34th session of the United Nations Human Rights Council in Geneva last March, she was subjected to a five-hour interrogation at the airport, and then had her passport confiscated. The authorities have repeatedly asked her not to “go beyond the red lines,” in other words, to stop her rights activism. Despite the threats and the abuse she has been subjected to at the hands of the Bahraini security apparatus, she has refused to be silenced, and has continued to use her voice to call for freedom and for a prosperous future for all Bahrainis. Guarantee in all circumstances that human rights defenders in Bahrain are able to carry out their legitimate activities without fear of reprisals and free of all restrictions including judicial harassment. Supporters can tweet at Bahrain's Minister of Interior (@moi_Bahrain) and at Minister of Justice and Islamic Affairs (@Khaled_Bin_Ali).